The upcoming Toshiba Thrive tablet has certainly generated a lot of buzz both before, and after its official announcement. As a fairly late attendant to the Android Honeycomb party, the device has some serious competition to face. We managed to spend some quality time with the upcoming tablet at an event in New York and we have some early impressions for you. In terms of build, the 10.1″ device feels quite solid. As far as weight is concerned, the Toshiba Thrive is in the Motorola XOOM territory, so we wouldn’t qualify it as light. The back of the tablet however, is made of textured, high quality plastic with a pleasant soft feel unlike its metal clad Motorola counterpart. This makes accidental drops highly unlikely. The Toshiba Thrive also deserves compliments for its removable battery and changeable back covers with different color options. The back covers will be priced at $19.99 when the sales of the tablet begin. The OS of the tablet is unmodified Android Honeycomb, save for the proprietary Toshiba application which utilizes the numerous storage options of the device. The aforementioned are certainly the features which will make the Toshiba Thrive stand out among its peers. Along with regular SD cards support, there is also a full USB connector. The memory app from Toshiba allows for a seamless transfer of data between the different types of storage. Overall, we came out very impressed with the Toshiba Thrive. 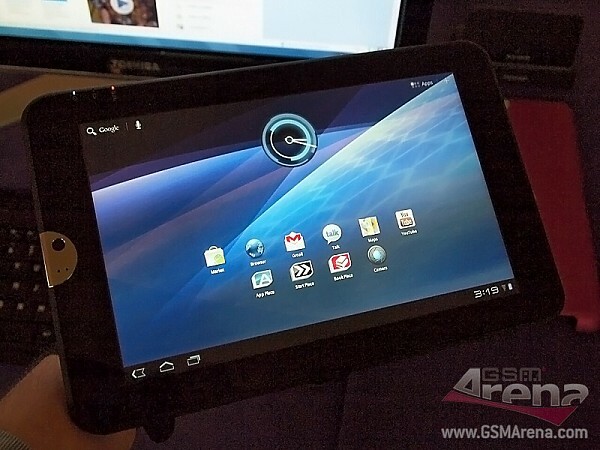 It will certainly be a serious contender in the crowded tablet market when it launches. Like we told you before, it is already available for pre-order with a starting price of $429.99 from several retailers.